Docker ... Docker -- everywhere ..
Docker has gained quite a bit of popularity in simplifying operations for micro services applications. It also helps reduce cost of development and testing applications improves developer productivity it’s the portable characteristics and by allowing them to create local development environment that mimics production. In this article, I will show how you can containerize or Dockerize a simple web application application that uses Apache Tomcat / Tom EE and Oracle database. This article assumes that you have Docker installed. If you want to get started with Docker, review their getting started guide. The following diagram shows the architecture for my application. I have several micro-services those are deployed in a separate Tom EE clusters and they depend on Oracle Database. 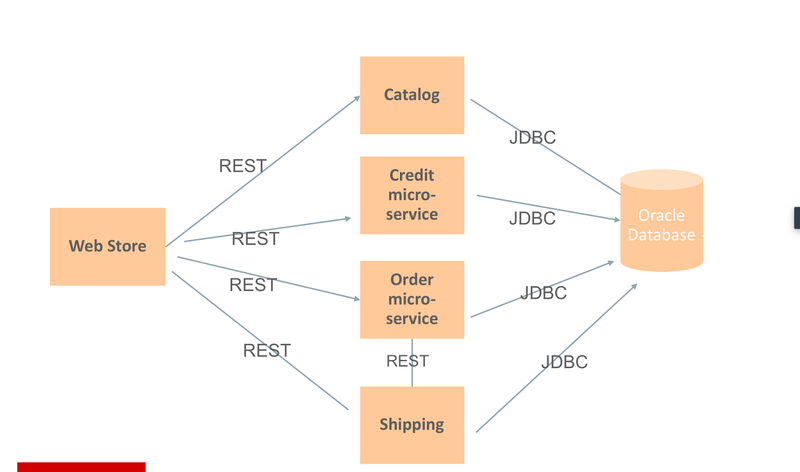 In this blog, I will deploy all my micro services into a single container and these micro services depend on an Oracle database that is running in a separate container. In my next blog, I will write about how to configure Oracle database in Docker. In a future blog, I will show how you can deploy multiple services in different containers and how they can communicate with each other. Here are the war files that make different micro-services for my application. 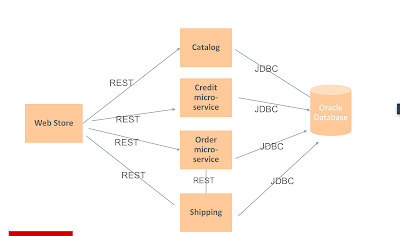 The micro services depend on a database running on a separate container named orcldb. The database is connected to a Docker bridgenetwork named appnet. Here is the content of the context.xml (DataSource configuration) that enabled Tom EE to connect to Oracle Database. Also Tomcat needs Oracle JDBC drive to connect to Oracle database and hence you need to deploy the JDBC driver (ojdbc6-11.2.0.3.jar) in the $CATALINA_HOME/lib of the Tom EE server. Let’s see how you can use Docker to build an image that contains all artifacts you need to run your application. Following is the content of my Dockerfile. This downloads JRE image from Docker repository, Tom EE from Apache Maven and copies all application contents (WAR files), JDBC driver, context files. You have to make appropriate changes for your environment that includes the values in the context.xml and additional JARs you might need. Here is an alternative Dockerfile that uses a Tar file that contains binary files for Tom EE version. You will output like this. This might take few minutes to pull/download images for JRE and Tom EE from Apache Maven. The application connects to an Oracle database and the database is connected to a Docker bridge network named appnet and hence I have to connect the order app container I created in the previous step to the same bridge network. Let’s now start the container using the docker run command. Ensure that you have the –p parameter to map your container port to the port of your host where you are running container. Your container should start as below and you will see the standard output in the console. Hope this blog helps to get your application Dockerized!